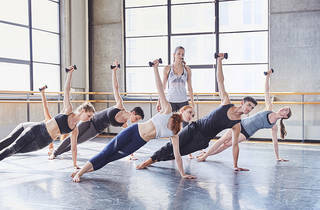 Consider it the Tiffany’s of barre classes: Lululemon for sale in the lobby, a hushed, deliciously scented space, the lockers and showers often missing at other barre studios. (Other locations include the Hamptons and Dubai.) More importantly, helpful and engaging instructors who are attentive to newcomers, while still making sure the regulars—the most flexible and most, um, enhanced students we saw all week—are hitting their goals. The only downside? Carpeting on the studio floor, which may skeeve germaphobes out. Pricing: $31 for one class, $270 for 10-class pack; $250/month for unlimited classes. New clients can get one week of unlimited classes for $31.